I’ve been clean for almost 2 months. Ever since I got my 17th lens back in June, I realized my camera gear addiction was spiraling out of control. So just like that, I quit ebay. No more daily routines of adding new auctions to my watch list. No more updating my spreadsheet for lens pricing (which has now grown to over 3000 entries). I even stopped visitng the Flickr “No metering lenses on Nikon DSLR” group — the primary source that was responsible for this addiction. I thought I was cured. My wallet felt heavier, and I was starting to use my gear more instead of buying more. Everything was good, until I had a relapse. One week later… and the above picture is the result. Dammit. As I looked on ebay, I told myself I was only looking and wasn’t going to buy. And when I started to bid, I told myself I was only bidding and wasn’t going to win. And when I won, I told myself… “Doh. How did that happen?”. So now I have a 4th zoom lenses in the ~50-200mm range that I don’t need (Already have a 55-200mm VR, 75-150mm Series E, and 80-200mm f/4.5). And I have a 4th flash that I don’t need (Already have a SB-24, Vivitar 5200, and Sunpak 433AF). Finally, a 1.6x teleconverter which is likely going to sit in my drawer like the 2x teleconverter has been doing all this time. I know that’s pretty insane. 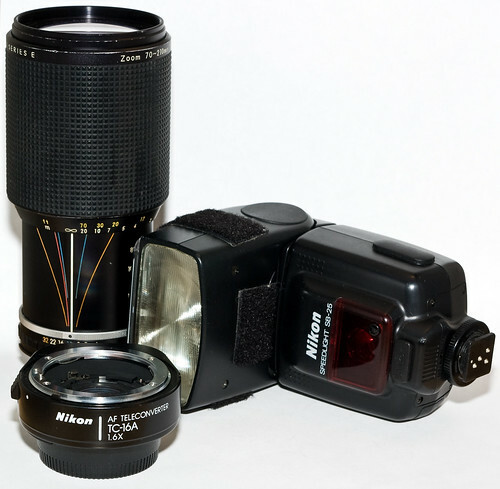 I know with the amount of money I spent on these old lenses, I could’ve gotten a new AF Nikkor. But there’s something about old glass that appeals to me. Nevertheless, enough is enough. I’m quitting ebay for good now. If I ever buy any more gear from ebay, you have my permission to shoot me. crazy…glad you’re putting the patch on to curb the addiction…it’s like me kicking my junk food addiction.